The 2018 Brighton half marathon was, I see, my fifth race here, though the route changes often. Seek not to understand the mind of the race planner, mortals. For this year, they sent us out to Ovingdean for the first leg, then back to the Palace Pier, out to St Peter’s Church and back to the pier, and then a long westwards drag to Hove Lagoon and back. It was cold; though we have not yet had the worst of the polar vortex, the wait for the start, though enlivened by having my photograph taken with other BSUH Charity runners, was chilly. When we set off, I must have fumbled my watch, for I found, as we approached the two mile point, that it had recorded no distance whatsoever. For this section, and as far as mile 7 or 8, I was reasonably speedy. But after that, I found it hard going. The trudge out to Hove Lagoon seemed interminable, and the return trip equally long and hard. Yet the crowd support, as it always is at any Brighton running event, was superb, and I was cheered by some spectators from my running club, Seaford Striders, including Kristy Sherry who took this splendid photograph below, and the BSUH Charity, led by Jess, with some very amusing placards. It was hard to summon up any speed at the finish, though I managed a sprint through the walking wounded. I staggered through the lines, and, to my great delight, was presented with my medal by Amanda Feast of Seaford Striders, a frequent Director of Peacehaven parkrun. I was disappointed to be slower than last year, but under the circumstances, I don’t think I should be too disappointed. There is some work to do, though, before the Beachy Head Marathon in the autumn. Whatever one’s own performance, other runners are always a source of inspiration. There were 23 Seaford Striders at the half, and 10 of them had passed through the club’s Couch to 5k groups; nearly all of the latter group were running their first half-marathons, and did outstandingly well. I ran thrice this week; I’m not sure this constitutes a taper, as though I scored fewer miles, they were all tough runs. On Wednesday it was a Striders run, though our numbers were depleted — something to do with celebrations of a 3rd century martyr, or of the day of which Chaucer said, 'Whan every foul cometh ther to chese his make’ — so off I went with a faster group, in wind and driving rain. I couldn’t keep up with them, but managed 4.13 miles. On Saturday, to Preston Park in Brighton, whose parkrun had been chosen by my running club as the first event in the 2018 club Grand Prix. It’s a fast flat parkrun, like those I usually frequent, and busy: this event had 568 participants, in contrast to last week’s Bevendean Down, where I was 21st out of 22. I had no particular goal in mind, and followed the 28 minute pacer for a while, but lost him early on. I kept going, and judge of my surprise when, at the finish, I found myself behind him again, and I managed a time of 28:20. Finally, on Sunday, I did something as unlike the half-marathon as is possible, the muddy, hilly Heathfield Park cross-country event. The course included mud, streams to ford or jump, ground with masonry in it (I overheard one runner complaining to a marshal about this, which I thought not quite the cross-country spirit) and fallen trees to climb over. It was sunny, and quite warm: I stripped off my base layer after the first lap and ran in nothing but a vest for the first time this year. On the second lap a shoe lace began to give me trouble, and, after a couple of retying, I saw through the caked mud that it had become so frayed as to be untieable. I finished the race with it flapping, acknowledging, I hope politely, the cries of various runners and spectators who helpfully drew my attention to it. Monday’s track night, with Seaford Striders, at the Lewes Leisure Centre track. After a warm-up, our group ran 300m with 100m recoveries. I lost count of how many. I’m not a big fan of track running, but this was oddly enjoyable. Wednesday’s club run with the Striders. It was a cold clear and still night, so my group headed for the sea-front, bagging a little under five starlit miles; one of our number ran a couple of circuits of the car park to make it up to the magic 5. On Saturday, I returned, with Rob, Paula, and Sweder to Bevendean Down parkrun. The latter took on the vital task of timekeeper, while 22 ran in total. It’s been a long time since I ran here, since September 2017 in point of fact. It remains a lovely, but hard course, this week made more difficult by the addition of a herd of cows at the top of the hill, whose hooves had stirred up the mud, which had then frozen into an unforgiving rutted surface. Some of my fellow runners took fright at the cows; we could have done with the presence of CharlieCat, who would doubtless have been able to draw on his repertoire of cowherd’s calls to move these beasts. I finished, with the tail-runner on my heels, in a rather disgraceful 35:24, though I see it was not my slowest ever time here. I need to return. To round the week off, today I ran according to time, rather than distance. My aim was to run for 1hour 45 minutes, and on road. The half will be on road, after all, and I’ll be running on mud again next weekend at the East Sussex Cross Country League event in Heathfield Park. So I set off, my aim to run towards Newhaven and turn as the clock struck 52 minutes and thirty seconds. The first half was a hard slog, into a chilly head wind, but took me almost exactly to Denton Corner, one of those serendipitous running accidents. The return journey was better and faster, as my splits show. In spite of the wind, the sun shone brightly. What will the weather do on half marathon day? Speculation is pointless, as I have to run it whether it’s snow or sun, -5°C or 20°C. Still, it would be nice to have mild still conditions. A Seaford Striders run on Wednesday; I took my group for a five mile run round the second half of the winter route. Once again, they outpaced me. 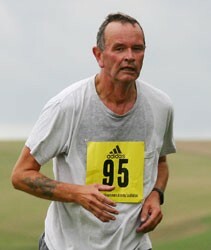 A Peacehaven parkrun on Saturday. It was a pacer day, and, since my PB at Peacehaven is 29:24, I latched on to the 28 minute pacer. My plan was, not to keep up with him, but to keep him in sight. This, I thought, would get me across the line in the desired time. It was not to be; my breathing has been a little troubled, and while I managed the first lap, the pace was too rich for the second and third of their winter course, and I crossed the line in 30:13. Nevertheless, this is my third fastest time here. Finally, today, I intended to do nine miles; I had no clear route in mind, but set off over Seaford Head in a fresh northerly wind hinting of snow, but bright sunshine between the clouds. When I reached the mouth of the Cuckmere, I wondered about following the river inland. The first few hundred yards of the river bank were encouragingly firm, so off I went, but this was deceptive. After that it was a mud bath all the way to the bridge at Litlington where I crossed to climb up to High and Over. I only fell once, and that forwards, so my hands and knees took the brunt. As I neared Exceat Bridge, I met walkers who’d parked by the bridge and, dressed in Sunday best, were heading for the mud. I didn’t warn them; they’d find out in due course. Nothing saps the will or leg muscles like mud, but I kept going. Along the river there’s plenty of ornithological interest: swans, geese and an exceptionally dim little egret, which tried to escape me by flying 100 yards up the river every time I approached it - off it would go, stop, and then be astonished that I was still on its trail. The bird and I continued to play out this comedy until the bridge. After the climb, I ran back down through the fields to Seaford. I met a man with two incredibly athletic dogs, running pell-mell up and down the fields. I complimented him on their energy. In the end, I only recorded a shade over eight miles, but I think that will do. Meanwhile, some of my Moyleman/Lewes Twitten run comrades went to southern Spain, for the Almeria half marathon, where they acquitted themselves honourably, with at least one PB. Here we shiver and watch the Spanish weather forecasts with envy. I have a week of next week. This means that, perhaps unwisely, I will go to track night with the Seaford Striders on Monday.